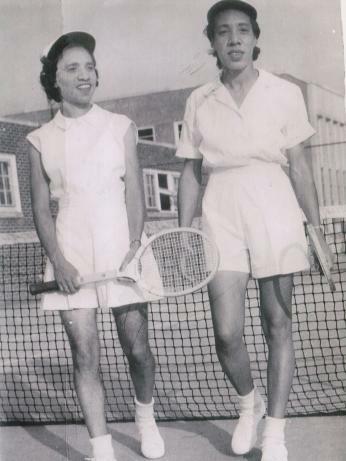 Margaret and Matilda Roumania Peters were African American tennis stars from the late 1930s through the early 1950s. Margaret, the older sister, was born in 1915, while Matilda was born in 1917. They grew up in the Georgetown district of Washington, D.C. where they first began playing tennis. As young girls, they could often be seen playing at a park across from their home in Georgetown. They were nicknamed “Pete” and “Repeat” for their doubles playing skills and last name. While still in high school, the Peters sisters attracted the attention of a tennis coach from Tuskegee Institute, Cleve Abbott, who offered each of them a four-year scholarship. Margaret, feeling uneasy about travelling so far away from home, deferred for a year until Matilda graduated from high school. The Peters sisters arrived at Tuskegee in 1937. In college, both sisters played basketball and tennis but they were best known for their doubles play in tennis and were exceptionally good at moves such as “slice serve” and “chop shots,” and had incredibly strong backhands. While in college they played in the American Tennis Association, ATA, tournaments. The ATA is the African American tennis league that still exists today. They both graduated from Tuskegee in 1941 with degrees in physical education. After college, they both continued to play amateur tennis in the ATA. Since they were amateurs, they had to pay for their own equipment, entry fees, and travel expenses. They won 14 doubles tennis titles between 1938 and 1941 and between 1944 and 1953. They gained some fame and played for celebrities, British royalty, and practiced with actors such as Gene Kelly. The Peters sisters were inducted into the Tuskegee Hall of Fame in 1977. Despite their skill, they were never permitted to test themselves against the great white doubles players of the time. By the time the walls of segregation in tennis started falling, the Peters sisters were past their prime and were never able to compete in racially integrated matches. Margaret moved to New York City, New York for a short time after graduating from Tuskegee and received a master’s degree in physical education from New York University. She returned to Washington D.C. and worked as a special education teacher. She earned a second master’s degree in special education from Coppin State College in Baltimore, Maryland. Margaret never married or had children. She died in Washington on November 3, 2004. Matilda played singles as well as doubles with her sister. She won national singles titles from the ATA in 1944 and 1946. Like her sister, Matilda went on to receive her master’s degree in physical education from NYU after graduating from Tuskegee. She married James Walker in 1957. Together, they had two children: a daughter named Frances Della and a son named James George. Matilda taught at Howard University in the 1950’s and then the Washington Public School System from 1964 to 1981. She also taught tennis to underprivileged children through the District of Columbia Department of Recreation. On May 16, 2003, Matilda died from pneumonia. Merlisa Lawrence Corbett, “Remembering the First Pair of African-American Sisters to Take Tennis by Storm.” Bleacher Report, Apr. 12, 2017, https://bleacherreport.com/articles/2353528-remembering-the-first-pair-of-african-american-sisters-to-take-tennis-by-storm; “Peters, Margaret and Matilda Roumania Peters, (1915 – 3 Nov. 2004 and 1917 – 16 May 2003), Respectively, Tennis Players.” Hutchins Center, http://hutchinscenter.fas.harvard.edu/peters-margaret-and-matilda-roumania-peters-1915-–-3-nov-2004-and-1917-–-16-may-2003-respectively.